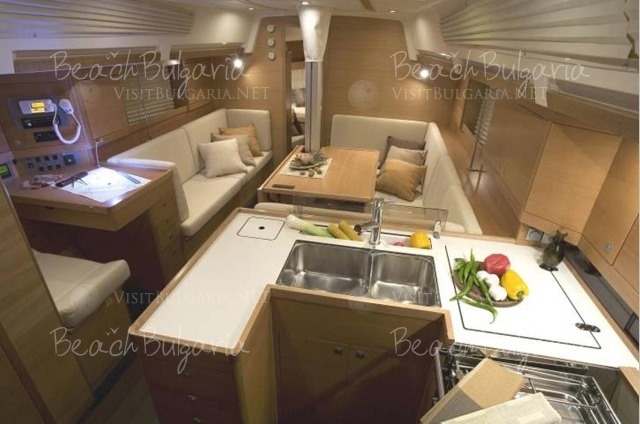 Elan 410 Yacht Charters in Bulgaria. Rent a cabin online and sail the Black sea. Elan 410 is an exciting cruiser racer with emphasis on style and outstanding performance. Her racing characteristics makes Elan 410 a contender at weekend regattas and yet perfect fast cruiser for sailing family during holidays. Long waterline length enhances her performance under sails as well her interior volume. Below deck Elan 410 is designed to set new standards for comfort and superior finishing throughout allowing the crew of up to eight members to enjoy their stay onboard. The fractional rig doesn’t hide its competitiveness and the cruising oriented sailor additionally can use non-overlapping headsail for balancing the powerful mainsail. Spacious open cockpit will find very affective both racing crew and cruising family. Large steering wheel speaks out racecourse but it makes her responsive and easy to control for a leisure helmsman. Deep heavy lead keel with its very low centre of gravity enhances stiffness and safety – attributes that benefits all yachtsmen whatever their preferred kind of sail. The Elan range of performance cruising yachts and Impression cruisers are all built under permanent technical supervision of Germanischer Lloyd for Sailing Yacht specification on a hull structure designed to give any sailor confidence. 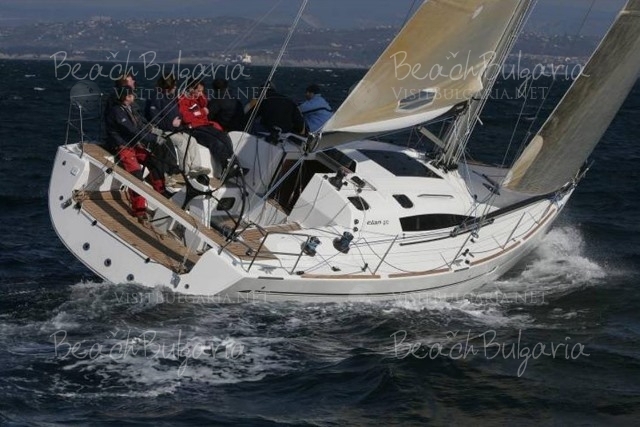 ** For Yach racing - 4000 Euro safety deposit; * Captain 1200 Euro weekly; * Extras, special service, catering is also question of negitiation; * Fuel, food, drinks, tips, Trans log and mooring outside the domestic marina are not included; *** Please note, taht 30% advance payment of the charter fee is required upon booking. The safety deposit is payable cash on spot in the marina. Last minute Majestic Hotel Sunny Beach - 35 % discount during 09 April - 23 April 2019. Early booking Grand Hotel Pomorie Pomorie - 30% discount until 31 March 2019; - 20 % discount until 30 April 2019!